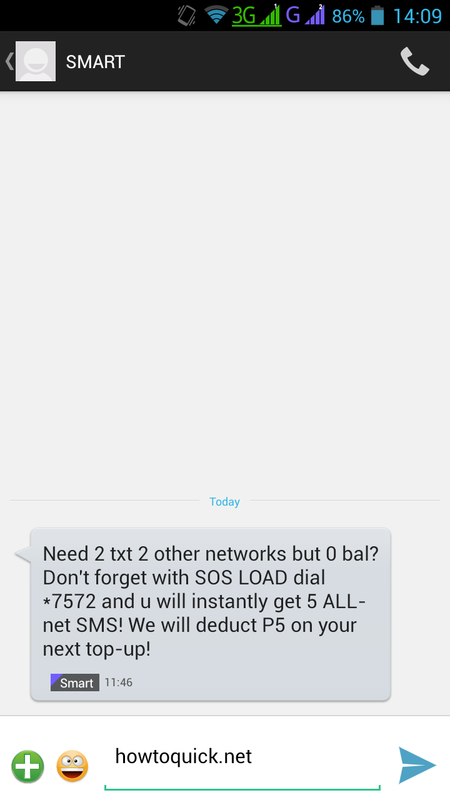 Just received a notification from Smart asking if I need to text to other networks with 0 balance. 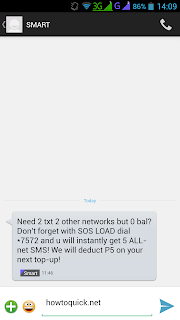 I don't know if this part of their recently launched Smart Load Manager services, it contains the instructions on how to get 5 all net texts without loading to your SIM card. This is part of their updated services for 2016 where you can just dial the number or USSD code *7572 for an emergency load request. To loan or avail emergency 5 SMS text to all networks, just use Smart USSD code by directly dialing it on your phone menu. Just dial the code *7572 and you'll automatically rewarded with 5 SMS to all networks. This service is not free. You will be automatically deducted on your next load. If you don't want to be deducted by Smart on your next reload try using their Request or Ask a Load service where you can ask any of your friends or family members load to be forwarded or share to you.